Thomas Weelkes’ place in English church music history is often somewhat overshadowed by the prolific output of two other great English church composers—William Byrd and Thomas Tallis. He was very much at the peak of his creative powers when he died, prematurely, in his forties. Like Purcell after him, he had a vivid imagination and a love of experiment, and nowhere is this more evident than in his four sets of madrigals, which appeared between 1597 and 1608. Arguably, it is with these madrigals that the English madrigal school reached its peak. 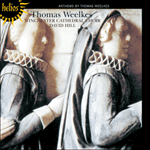 Weelkes published no further madrigals after 1608, and instead devoted himself to the production of a large quantity of church music, probably for use at Chichester Cathedral, despite the fact that he was constantly in trouble with the church authorities. 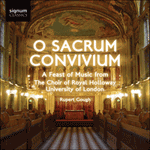 Alleluia, I heard a voice is unified by recurring musical and verbal material, a device which the composer had earlier explored and developed through his madrigals. Alleluia! I heard a voice as of strong thunderings saying, Alleluia; Salvation, and glory, and honour, and power, be unto the Lord our God, and to the Lamb for evermore. Alleluia!